Control panel home page - Displays list of campaigns. 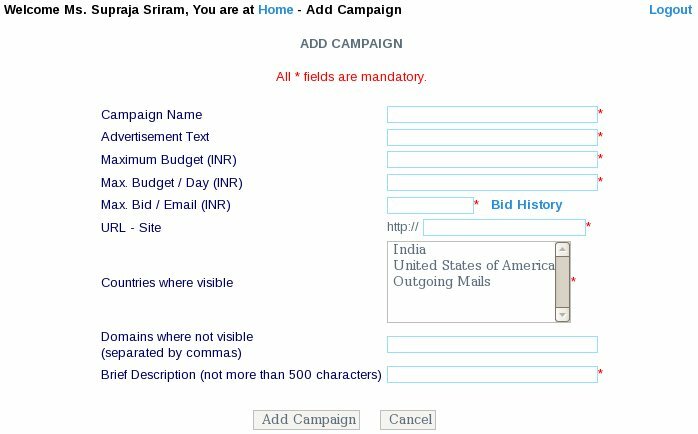 Campaign Details page - Showing campaign details like URL, text and budget details. Campaign Details page - Shows summary of overall campaign performance. Details shown include CPC, Number of Impression and cost details. Campaign Details page - Graph showing Number of Impression of Advertisement over a period of time. Campaign Details page - Graph showing Number of clicks due to advertisement over a period of time. Campaign Details page - Graph showing Cumulative CPC over a period of time. 1. Control panel home page - Displays list of campaigns. 2. Add New Campaign page. 3. Campaign Details page - Showing campaign details like URL, text and budget details. 4. Campaign Details page - Shows summary of overall campaign performance. Details shown include CPC, Number of Impression and cost details. 5. Campaign Details page - Graph showing Number of Impression of Advertisement over a period of time. 6. Campaign Details page - Graph showing Number of clicks due to advertisement over a period of time. 7. Campaign Details page - Graph showing Cumulative CPC over a period of time.